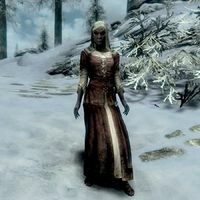 Irine is a Dunmer traveler who can be found wandering around Dawnstar, close to the Windpeak Inn. She is named in Azarain's Journal as a possible member of a Daedric cult due to the fact that she seems to know more about alchemy than the proprietor of The Mortar and Pestle. You will be tasked with pickpocketing or following Irine during the related quest to see if she will lead you to the Daedric cult. However, she is not a member of the cult, and you will need to follow Harald instead to progress the quest. Irine disappears at the conclusion of the quest.